insidetraxs - bet smarter! - Shows you how to use Betfair Exchange to turn bookmaker offers into cash as well as other strategies. What do you mean by “drifting” odds? 3/4 makes it a good start to April! NAP got beat again going out in front and then capitulating at the 1f pole. FALSE FAVOURITE got beat by a head – HURRAY. We also tell you more about the Betfair Exchange trading videos we do. We are still providing you with tips including our NAP OF THE DAY and other tips for use with Betfair to make you money. The Back to Lay selection includes a screenshot of the last number of races so you can see BSP versus IP Lo. What are Betfair charts and how can I use them to make a profit? This practical guide to reading a chart and one example of how the information it gives us can help us Bet Smarter. The NAP OF THE DAY runs at Musselburgh 3.15. I like this horse. It really is like a rocket coming out of the stall and will lead. Just a matter of will he see it out. If the going was anything less than good I would say no but at good to fim this horse can just run them ragged. If you don’t want to back the horse it would still make a very attractive back to lay!! Alastair Rawlinson is a good up and coming jockey and rides from the front well. He has a good draw on this 5 year old and has every chance of getting out from there into the lead. He won off 3lbs lower here in December and tried to make all against a much better field, again here over C&D in a Class 2. Back down in class to a level he will be competitive at I take him to be in the mix from the front going into the final furlong. The chart below shows that he has traded below his BSP on of his last 14 starts. ADVICE: Back to Lay looking for 50%+ profit on your stake. Currently trading at around 15.0 our unique “Back to Lay Staking Calculator” will advise you to lay at 10.0 to get 50% return guaranteed on your money. 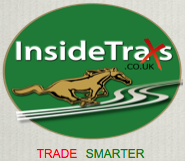 You can download the Excel spreadsheet with the “Back to Lay Staking Calculator” for FREE at www.InsideTraxs.co.uk it’s on the bottom of the homepage with our “Weight of Money Calculator” and our “Weighting Calculator” – which tells you if a horse is over or under weight in the betting. Done OK in three outings finishing 946-. Money has come for this horse this morning so there is some confidence there. He is also well bred and this extended distance will suite on handicap debut. However does it deserve to be so short – 3.45 on Betfair? A LAY BET at 3.45. If lumps of money come on in the last 10 minutes then best retire gracefully (ie if it trades much below 3). I like this horse who always runs a genuine race. Jamie Gormley is very much worth his 3lb allowance and Jim Goldie does well at the track. He is back to his last winning mark and I expect a good showing. © 2019 - insidetraxs.co.uk. All Rights Reserved. Horse Racing Tips, Strategies, Advice, News and Offers.